Popular European seasonings used to flavor and remove the strong, gamy flavor of roasted or barbecued wild meats such as venison, squab and wild boar. 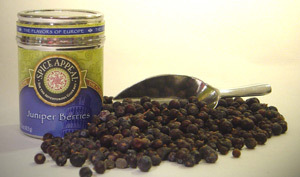 Its woody and lemony flavor adds a pleasant tartness to cheeses, goose, pot roasts, pickled meats, seafood and cabbage. Also used in liver pates, stuffings and German sauerkraut.